Close your eyes, and in your mind, picture a place that you remember well, for what ever reason. Savour it. Feel the energy of it. What touches you? Is it good or bad? Does it involve nature and the great outdoors? Or are you inside a large building, possibly a spiritual place? Are you happy or sad? Explore what you are feeling. Virtually everywhere in Britain has a history, and has consequently acquired energies, ley lines, and its own special atmosphere. Some people are sensitive to it; some of us dowse for it; others will pick up on an uplifting, positive power of place, relishing the reverence of a church or cathedral; a few will home in on the sadness of a building, and even spirits. All this history and energy has been accruing from some part of our culture over the last 5,000 years or so, and beyond. Ancient myths, legends and old wives tales almost always have origins in fact and truth. And it all builds up into that elusive power of place. Using sacred geometry, some high powered mathematics and a heck of a lot of research, our speaker on 27th June, author David Furlong, has discovered what appears to be geometric patterns projected onto the landscape. For example, taking into account various powerful places, landmarks, ratios and ancient religious sites and buildings, there is a pentagram (a five-sided figure) over Scotland, a symbol of protection from evil. Triangles also appear quite frequently, notably over Wiltshire, and suggest a possible connection with the Great Pyramids in Giza, Egypt. Longitude and latitude play a part too. Triangles are often to be found within circles, and the Marlborough Downs in Wiltshire demonstrate this. David Furlong showed us a map on which he had drawn a circle linking several powerful sites, many of which date back thousands of years and are astronomically aligned, mostly within six miles of each other. David suggests that if there are more than six key sites on a circle, it is almost certainly not by chance. Intriguingly, there is another circle alongside, of exactly the same size, based on yet more key sites, and which overlaps the first circle. Where they overlap echoes the form of the vesica piscis, a major part of sacred geometry. And in this area on the map, the renowned Michael ley line is to be found, together with Temple farm, Temple Bottom and even indications of a Temple Convent, all of which almost certainly originated with the Knights Templar, c. 1129–1312. If you then convert to the units of measurement the Templars would have used – cubits and furlongs – the measurement of these two circles fit into the circumference of the earth exactly 666 times. 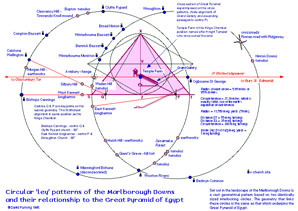 Circular 'ley' patterns of the Marlborough Downs and their relationship to the Great Pyramid of Egypt. Another pattern of significance – the Hebrew Kabbalah, or Tree of Life – appears to overlie the Malvern Hills. The Kabbalah is based on the main chakras of the body, which allows us to tune in to our own spirituality, and connect with the landscape. It invokes the measurements of Pi (3.142), from the Greek alphabet, symbolizing the ratio of a circle’s diameter to its circumference, and strongly suggests an advanced culture, with a far higher intelligence than our own. We are most comfortable when there is balance. Too strong an energy can be disturbing, and even cause panic. We sense all these things but don’t always heed them. David Furlong suggests such intuition and sensitivity comes from our Higher Self. Those who believe in reincarnation (not everyone does), suggest that when we die we remain in spirit until we choose to be born again, to live another life on earth in order to learn lessons we missed in a previous incarnation. So when we come into our new body (whether at birth or conception is not known), part of us is left behind, our Higher Self, to act as a sort of mission control. Our Higher Self is mindful, fully aware of all that is going on in our lives; every thought is registered, but mission control remains passive until threatened. It connects into our core essence, and knows when we are in danger. There is so much anecdotal evidence of people who nearly died, or unexpectedly survived, or were saved at the last minute, and often there is no tangible explanation except for this Higher Self, which also enables us to recognize the power of place in the landscape.